A. The official flag of Louisiana shall be that flag now in general use, consisting of a solid blue field with the coat-of-arms of the state, the pelican feeding its young, in white in the center, with a ribbon beneath, also in white, containing in blue the motto of the state, "Union, Justice and Confidence," the whole showing as below. B. The state flag shall wave from sunrise to sunset every day, over the State Capitol and the public departments and institutions of the state and over the court houses in the several parishes during the sessions of the courts. C. The state flag shall wave during the regular school hours every day of the school year over the public institutions of learning in the state that are now flying the United States flag and all other public institutions of learning in the state are authorized to fly the state flag. Amended by Acts 1954, No. 449, §1; Acts 1964, No. 390, §1; Acts 1966, No. 42, §1. The website at www.2theadvocate.com/news/2586846.html reported on 6 April 2006 that a bill requiring the flag to have three drops of blood on the pelican's breast was approved by a House Committee. Historical renditions and descriptions of the flag also include three drops of blood on the mother's breast. The blood signifies the willingness of the state to sacrifice for its children, said D. Joseph Louviere, an eighth-grader at Vandebilt Catholic High School in Houma. It was part of the original descriptions of the state's earliest flags. But Louviere found that the use of blood drops on the state flag has been inconsistent. Last month Louviere wrote a school report on the flag, which he presented to his local legislator, Rep. Damon Baldone, D-Houma. Baldone, a lawyer, said he noticed that, despite all the historical evidence, state law did not specify the number of blood drops. He drafted legislation to fix that. The House Judiciary Committee unanimously recommended House Bill 833, which would require all Louisiana flags made in the future to have three blood drops. The bill would not require old flags to be changed. Louviere's quest for flag history took him to a study printed by LSU in January 1920. The pelican was added to the state seal by William C.C. Claiborne, the state's first American governor, and used unofficially to rally Andrew Jackson's troops at the Battle of New Orleans in 1815, according to the LSU study. Over the years, the pelican was on all sorts of flags, some red, others blue, according to the LSU study. A blue pelican flag was displayed at the convention when Louisiana seceded from the Union at the start of the Civil War. Union Admiral David Farragut removed a pelican flag from the Old State Capitol when he captured Baton Rouge. The pelican symbol was described in state law in 1902. The flag used now was legalized July 1, 1912. Its description requires "a pelican vulning herself, which means the mother's beak is tearing at her breast to feed her own young. The bird is considered a symbol of self-sacrifice. A new state flag, featuring a more angular pelican tearing its bleeding breast to feed its young, was unveiled Monday [22 November] during the swearing-in ceremonies of two state officials. The flag's design is similar to the existing flag but the brown pelican, the state bird, is more sophisticated and has three red drops of blood flowing from its breast, said Jacques Berry, chief spokesman for Secretary of State Tom Schedler's office. The new design was required by a bill passed by Rep. Damon Baldone, D- Houma, during the 2006 legislative session based on the historical research of Joseph Louviere, a Houma student, which indicated the existing pelican seal did not have the bird tearing at its breast. Historical descriptions of the blue flag include the three drops of blood, described as a sign of the state's willingness to sacrifice itself for its citizens. The design goes back to medieval times, when people believed pelicans fed chicks with their blood. Berry said that the secretary of state's office, which is charged with keeping the state seal, will order about 25 new flags at first for use by the office, its museums and the State Archives Building. He said he will notify the state agencies that the new flags are available, but each department or board will need to order them on its own. The 2006 law requires the depiction of the pelican "tearing its breast to feed its young" to include "an appropriate display of three drops of blood. The Louisiana flag contains two elements: a crest centered on a blue field. The crest consists of a nest bearing three chicks, a mother pelican vulning herself with her head turned to the viewer's right and displaying three drops of blood on her breast. Beneath the nest a white banner bears the state motto "Union Justice Confidence." The flag shall be 7 units tall by 11 units wide. The crest is to be treated as a single design element, inclusive of the mother pelican, chicks, nest and banner. For positioning purposes, the center of crest is the center of the triangle formed by three drops of blood. The crest is centered both vertically and horizontally on the field. The crest, measured through the center vertically and horizontally, is 5 ¼ units tall (from tip of mother pelican's head to the bottommost point of banner) by 6 units wide (form tip to tip of banner measured from lowest corner of each tip). Note on font: The font used for the motto, although always treated as an inseparable element of the crest, is a hand-rendered font for specific use on the flag. This version of the flag lacks the three red drops of blood on the pelican's chest. This particular version of Louisiana's flag was flown in abundance throughout Louisiana from at least the mid/late 1960's (probably) until the early 1990's, as Annin apparently had a corner on the Louisiana flag market in Louisiana. In fact, this flag was so prominent during that time, that I thought this was how Louisiana's flag was supposed to look. It was only after the early 90's that Louisiana flags flown in the state began to all have a more or less standard look. I still occasionally spot one of these blue winged flags even today and saw one in Slidell, Louisiana a few weeks ago. Michael Smuda raised to question about the Louisiana state flag in regards to the wording. The version I have says "UNION JUSTICE CONFIDENCE" with no punctuation or connector. The FOTW version says "UNION, JUSTICE & CONFIDENCE" with the ampersand. And I have seen several on the web with "UNION, JUSTICE AND CONFIDENCE" with "and" spelled out. Which is the official, and where did the others come from? After checking with Whitney Smith, whose image shows the ampersand, it appears that the state is very lax about the flag wording and manufacturers use their own judgment. On the website of CODOFIL (Comité pour le développement du français en Louisiane), we can see the motto on the Louisiana's flag written in French instead English, where we can read "Union justice et confiance" instead "Union, justice and confidence). "I pledge allegiance to the flag of the state of Louisiana and to the motto for which it stands: A state, under god, united in purpose and ideals, confident that justice shall prevail for all of those abiding here." One of the many early flags of Louisiana. This was flown in January of 1861. It never had official status. It is described on page 147 of the book "Flag Book of the United States" by Whitney Smith. There is an image of this flag on page 136 of the book "Flags through the Ages and Across the World" by Whitney Smith. A vertical tricolor of blue, white and red with a ring of seven five pointed upright regular white stars with one star at the top on the upper hoist. This seems to have been influenced by the French national flag and looks quite like the Acadian flag. Could this flag be a misattribution of the Confederate Revenue Service (i.e. Customs) ensign? It seems identical and the one example The Flag Book of the United States gives as an example of its use in Louisiana was on a captured Federal Revenue cutter. This flag of Louisiana was adopted on 11 February 1861 based in design on the U.S. flag, having a square canton and 13 stripes. The canton was red, with a single yellow star, which replicated the colours of the Spanish flag. The stripes alternated blue/white/red/white/blue/white/red/white/blue/white/red/white/blue; replicating the colours of the French flag. It is referred to as the flag of the Republic of Louisiana in some cases, but this is not accurate. By February 11, 1861 the Confederate States of America had been organized and Louisiana was a member, so this was the flag of Louisiana as a Confederate State. The flag flown by Louisiana prior to the adoption of this flag, was the Pelican Flag, which was never officially adopted, but commonly used prior to and during the war. A Pelican Flag was flown at the time Louisiana seceded, so it might be more proper to consider it the flag of the independent republic between secession and creation of the Confederacy. The Pelican Flag was not officially adopted by Louisiana until July 1, 1912. The Louisiana state museum finally wrote back concerning the Republic of Louisiana flag. It says in a nutshell that the canton may have been rectangular or square - both considered correct. There are no original surviving "Republic" flags and descriptions of the flag are ambiguous. I think that the museum tends to lean toward the square canton for reproductions mainly because they believe that the square canton balances out better with the gold star. They do know that Old Glory blue and old Glory red are the correct colors for the flag. They also say that Spanish Yellow is an acceptable color standard for the gold. I have a flag that I believe to be from the newly formed "Republic of Louisiana" Feb 1861. It is silk, has thirteen red, white and blue stripes, with a square red canton and yellow five-pointed star pointing to the upper hoist. I came across some very interesting references to the flags that were used in Louisiana during the years 1860-61. All the references in this contribution are from Bragg, Jefferson Davis, (Louisiana in the Confederacy. Baton Rouge; Louisiana State University Press, 1941), the greatest scholarly work on the subject of Louisiana during that period. The first reference to a special flag during this period comes from a New Orleans newspaper, the Picayune. This is a report about celebrations on December 21, 1860, for the secession of South Carolina. "As the first gun was heard, the flag of Louisiana was hoisted from the third story window of the rooms of the Southern Rights Association, ... the flag is, like the original flag of Louisiana, of spotless white, with the addition in the centre of a red star, containing in its centre the emblematic pelican." (Bragg 24) The wording of this quote leads me to believe that this flag was somehow unique. It is interesting to note that pelican flags of various designs have been used in Louisiana since at least 1804. I have not been able to find any details about the size and proportions of this flag. Now later on, in the same book, I did find another reference to a pelican flag that may or may not be the same as this flag. On January 26, 1861, the Convention for Secession voted to dissolve the Union between Louisiana and the United States. Bragg reports, "A beautiful Pelican flag was unfurled on the president's table." 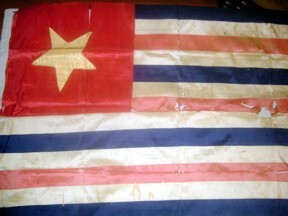 (32) Bragg provides no details about what this flag may have looked like, but it is reasonable to assume that it could be the red star flag described as being in use in New Orleans just a month earlier. It was not until February 11, 1861, that the "national" flag of Louisiana was adopted. However, this did not prevent the use of the pelican flag unofficially. The state military crest, which is the crest used in the coats of arms of units of the National Guard, as granted by the precursor organizations of what is now the Army Institute of Heraldry. The official Institute of Heraldry blazon is "A pelican in her piety affronte with three young in nest, argent, armed and vulned proper." I found a flag for Louisiana using the pelicans and the motto from the Louisiana state flag in the blue bar at the hoist. These flags became popular in the South during the debates and arguments that began in 2001 over the 1956 Georgia state flag. In each case, the 1956 Georgia flag design was adapted to one of the former Confederate states by replacing the Georgia state seal with the seal or other prominent flag emblem from one of the states. The idea behind the flags following this pattern was to show support for and solidarity with the supporters of the 1956 Georgia state flag design.